Who Do You Trust explores the universal question of what trust means and how we perceive it … using new cinematic portraiture techniques and modern dance we hope to draw viewers deep into the questions of how our ever changing society interacts with the concepts of trust. Also will technology change our ideas about trust as we move deeper into a transparent world? 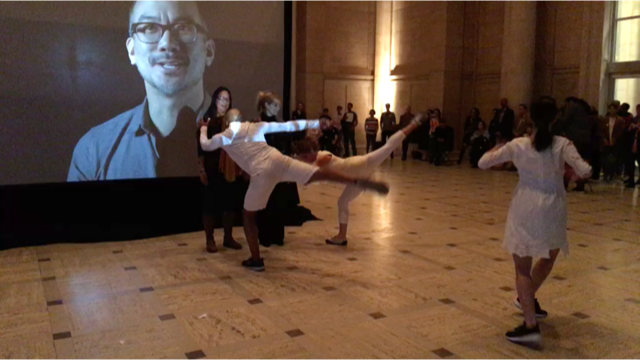 The event includes an installation, featuring a score by Joan Jeanrenaud, that will be on view at the Asian Art Museum in San Francisco in Samsung Hall from Tuesday, April 18 -20 and Sunday April 23 - 26. On April 20th 6:30 - 9:00pm will host a live dance performance by KAMBARA + DANCERS with audience participation.